CLASSES — Curio Spice Co.
Spice 101: Spring into Flavor! Shake off winter! Join us for the spring edition of our intro-to-spices class. Learn how to cook with spices, when to toast and grind them, why to temper or bloom them and how to layer them in different dishes. We’ll serve a memorable tasting menu focused on the season’s lighter and brighter ingredients, bringing the spice lessons (and your palate!) to life. Menu includes: Mastic-beet sharbat, preserved lemon, ricotta & pepper crostini; green salad with baies roses dressing; Mazeh spiced kabobs with saffron rice (chicken or vegetarian), Fleur spiced rhubarb friands & flower tea. You’ll head back to your own kitchen with new recipes, our spice flavor wheel and a preview jar of one of our newest blends. Ready to build irresistible meals more quickly? Join us to learn how to build complex flavors into homemade meals without spending hours in the kitchen. You’ll get acquainted with short-cuts and techniques that Indian cooks use to streamline weekday cooking. Suman will feature her family’s garam masala* - the star and workhorse of Indian spice blends - in several of the recipes. While most Indian home cooks use pressure cookers, this tool is not as common in American kitchens. Suman will demonstrate how to make one of her favorite curries using the Instant Pot™ (a trendy new pressure/slow cooker), and you’ll be thrilled to discover how weeknight meals that burst with flavor come together more easily. *New blend alert! We’re excited to introduce our newest blend, “Suman’s Garam Masala,” a family recipe that Curio is now honored to produce. Learn all about the beauty of spice blending! 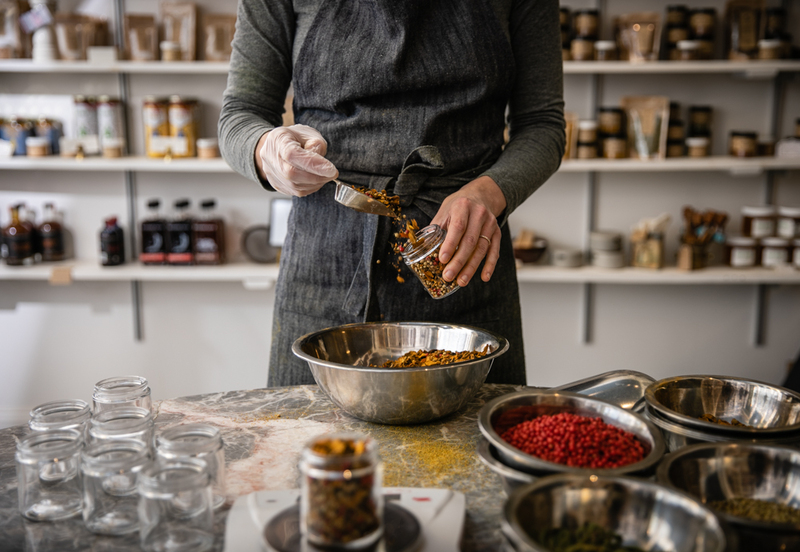 You will make your own spice blends in class and learn about how we approach creating a new blend — from idea to execution. You will get an in-depth look at our flavor theory and how we use it to build balance and originality into our blends. You will also learn about the traditions inherent to spice blending and how spices give us an incredible lens through which to learn about history and culture. You will smell and taste lots of spices and you'll also be fed some special treats (savory and sweet) made with our blends so you can understand the impact of quality spices on food. Each student will take home 3 spice blends made in class ~ 2 traditional blends that we'll create together and 1 blend of your very own creation. Our summer classes are heating up! Stay tuned for our summer offerings - tickets available starting mid-April 2019. The perfect date night or Valentine’s Day gift! Spend the evening at Curio Spice and take a virtual trip to Madagascar. We’ll take a dive into the world of vanilla and chocolate — exploring the complex history of vanilla, one of the world’s most valuable spices, tasting Malagasy chocolate, and sampling other Malagasy spices such as wild pepper and baies roses. You’ll learn why vanilla and chocolate share a tangled past; how to use vanilla in surprising new ways (such as in tomato sauce! ); and, how you can play a part in improving farmers’ livelihoods at origin. Our friend Matt Amato will lead the evening — he lived in Madagascar for five years following a Peace Corps stint and before working as an industry professional. Curio founder Claire Cheney will guide our olfactory spice tour and share tips for using these exquisite ingredients. Ticket includes a signature spiced cocktail and light tasting menu, plus you’ll take home a gourmet vanilla bean and recipes for using it. A percentage of ticket sales will benefit Macolline, a non-profit working to protect forests in Madagascar and generate jobs in the region we where source vanilla. As happy as they are, the holidays can leave us weary and unexcited about stepping back into the kitchen. Spice 101 ~ Winter Refresh is sure to reinvigorate your mojo in the kitchen. Learning how to cook with spices is something every home cook should master, and we're thrilled to show you how! Just when you thought winter was feeling rather bland and uninspiring, join us for Spice 101: Winter Refresh, where you'll learn how to toast and grind spices, why to temper spices in oil, bloom others in water, layer them in recipes, make simple condiments and even use them in drinks. You'll take home our signature Spice Flavor Wheel, along with recipes and a jar of a spice. Menu: orange hot chocolate (with or without bourbon), Bazaar Baharat hummus; spiced leafy greens, chicken (or vegetarian option) with coriander, fennel & roasted clementines; Greek lemon & herb cake & cardamom coffee. Do you love curries, but want to know more about the vibrant and diverse cuisines of India? Join us and Suman Shah for a class that goes deeper into the regional dishes and unique cuisines of India. We will explore recipes beyond classic curries—you will learn how to use ingredients like fenugreek, fennel and farina in a vibrant stuffed vegetable recipe called undhiyu, from the Gujarat region, then travel to the Eastern regions for a smoky and mustardy eggplant chokka, India’s version of baba ghanouj, and much more. Suman draws inspiration from her Indian roots (Calcutta to Mumbai) and a life of almost twenty years in New England. When not hosting cooking demos or classes around Boston and at farmer’s markets, she’s writing about food, life and photography. Her Market Day and Vegetarian Voyager recipes on her blog Fork on a Road show us her instinctive style of cooking from different corners of the world. She makes familiar foods in unexpected ways, making them healthy, versatile and easily adaptable for a busy life. Find her on Instagram @forkonaroad. Let spices be your awe and splendor in the kitchen this season, transforming bland, "black and white" food into full Technicolor flavor. Learning how to cook with spices is something EVERY home cook should master, and we're thrilled to show you how! Just in time to learn some new skills for Thanksgiving and Holiday cooking and baking, join us for Spice 101: The Harvest Kitchen — you'll learn how to toast and grind spices, why to temper spices in oil, bloom others in water, layer them in recipes, make simple condiments and even use them in drinks. You'll take home our signature Spice Flavor Wheel, along with recipes and a jar of our not-yet-released Harissa spice! Menu: Cranberry Fleur Shrub, Harissa winter squashed hummus, Baharat + Roasted Apple Chicken, Kozani Brussels with feta, Sichuan Five Spice beets & Da Lat Banana Bread with Smoky Vanilla cream. Come hungry and leave inspired! Join Suman Shah for a vegetarian exploration of comforting curries using warming spices and seasonal produce. You will enjoy learning how to make a special Punjab bean curry as well as a Kashmiri Cashew curry along with unique appetizers, sides and a dessert. Let the spice blends wrap around you like a warm hug ushering in the change of seasons and share in some delicious stories with us in Cambridge. Allergen note: there will be several types of nuts used in this class. Looking for ways to add unique flavor and dimension to your bar this summer? Join our friend Meredith Powell for the inaugural Curious Cocktail Class. Spices have been used throughout history to add depth and interest to alcohol, but recently bartenders have started using spices to create "craft cocktails" — libations that delight the senses with hand-made syrups, bitters, and infusions. You can sample such cocktails at a bar, but why not hone your entertainment skills and learn to make them yourself? Meredith will demonstrate three different spice infused cocktails (one shaken, one stirred, and one punch) to arm you with new techniques and delightful flavors. We’ll be serving thoughtfully paired snacks, prepared by Orange Door Kitchen, to accompany the drinks. Orange Door Kitchen is a new and exciting event space and commercial kitchen that’s located in West Acton, MA and is the collaborative venture of husband and wife team, Chris and Meredith Powell. ODK grew out of their life-long love of food, cooking, and bringing people together to celebrate life through food. Chris and Meredith are also active in several local and national food-access and food-justice non-profits. Find them on Instagram @OrangeDoorKitchn and learn more about ODK at their website. Sometimes the best food is found in the most unlikely places — which in India might be at a tiny, roadside cart. Street food is quintessential to Indian cuisine, as a snack to tide you over until dinner or sometimes as a full meal in itself. In this demonstration class, Suman Shah will lead us on an imaginary trek from Boston to Bombay and introduce us to some of her favorite street foods, as diverse as Indian cuisine itself. Street food recipes are an easy way to try Indian cooking at home and are more flavorful than any take-out! Join us for this tangy, crunchy, spicy, and delicious journey right here at Curio Spice in Cambridge. Suman draws inspiration from her Indian roots (Caluctta to Mumbai) and a life of almost twenty years in New England. When not hosting cooking demos or classes around Boston or at farmer’s markets, she’s writing about food, life and photography. Her Market Day and Vegetarian Voyager recipes on her blog Fork on a Road show us her instinctive style of cooking from different corners of the world. She makes familiar foods in unexpected ways, making them healthy, versatile and easily adaptable for a busy life. Find her on Instagram @forkonaroad. Learn all about the beauty of spice blending! You will make your own spice blends in class and learn about how we approach creating a new blend - from idea to execution. You will get an in-depth look at our flavor theory and how we use it to build balance and originality into our blends. You will also learn about the traditions inherent to spice blending and how spices give us an incredible lens through which to learn about history and culture. You will smell and taste lots of spices and also you'll be fed a few special treats (savory and sweet) made with our blends so you can understand the impact of quality spices on food. Each student will take home 4 spice blends made in class ~ 3 traditional blends that we'll create together and 1 blend of your very own creation. Ready to take your spring & summer cooking to the next level? Our Spice 101 ~ Spring Into Summer class will give you confidence to launch into your summer recipes with new knowledge and flavors! Menu: Mastic lemon spritz, Kozani spiced gougères; early-summer salad with baie roses dressing; Chili Today tacos (vegetarian or carnitas), Fleur spiced rhubarb friands & flower tea. In this class, you’ll learn how to use spices in unexpected ways, gain some olfactory training (like sniffing wine), and master some technical skills, such as knowing when to toast and grind spices or not. We’ll explore a bit of spice history and introduce you to the science of aroma — and you’ll enjoy a tasting menu of memorable drinks, appetizers, mains, and desserts. You’ll return home armed with recipes and new culinary excitement. Join us for a demonstration class with local chef and vegetarian recipe developer, Suman Shah to learn how to layer flavors, use spices, and balance flavors like an Indian home cook. dessert — and head home with recipes and tips for successfully making them at home. Fat fennel seeds waiting to be toasted for garam masala. Together, we’ll “trek” to three countries during the evening, making a virtual visit to Japan, Greece and Sri Lanka, each an important source for Curio’s spices. We’ll regale you with a few origin stories and learn about the key spices of these three ancient cuisines. You’ll learn how to make a dish or two that are typical of each country. We’ll discuss why spices play an important role in defining the identity of place and the terroir of spices and how honoring this tradition will make your cooking more vivid. You’ll enjoy a tasting menu of memorable drinks, appetizers, mains, and desserts and head home armed with recipes and new culinary knowhow. As happy as they are, the holidays can leave us weary and unexcited about stepping back into the kitchen. Spice 101 ~ Winter Refresh is sure to reinvigorate your kitchen mojo. Menu: Mastic Lemon Spritz, saffron popovers with easy pepper marmalade; salad with baie roses dressings; toasted spiced chicken with clementines Greek lemon & herb cake & flower tea. In this class, you’ll learn how to use spices in unexpected ways, gain some olfactory training (like sniffing wine), and master some technical skills, such as knowing when to toast and grind spices or not. We’ll explore a bit of spice history and introduce you to the science of aroma — and you’ll enjoy a tasting menu of memorable drinks, appetizers, mains, and desserts. You’ll return home armed with recipes and new culinary excitement. $85 per person. Join us at Curio with Chiang Mai native & wonderful chef Renu to learn about the spices and flavors that are signature to Thai food. You may have tasted her cooking at one of her pop-ups at Urban Hearth, next door, but now you can learn how to re-create those flavors at home. Curio founder Claire spent 4 months in Thailand before launching her business, and will share some of her knowledge of Thai spices. Learn how to make som tum (green papaya salad), Thai cocktails, and even your own authentic Thai curry paste. $65 per person includes drinks, tasting and recipes to take home. In Spice 101 Summer Cooking you'll learn new techniques on how to make the most of your spices for your summer recipes, from grilling to picnics to simple dinners. With both sensory training like how to tell the difference between black, pink and sichuan peppers as well as why to use certain salts with certain foods you'll leave feeling both energized and inspired to cook. We'll cover a bit of history and science while also arming you with recipes for cool drinks, appetizers, mains and desserts with flavors you won't forget. Learn about using beautiful edible flowers in your cooking. From fresh flowers like Rosa rugosa petals to dried flowers like culinary lavender, your heart and palate will be truly lifted. Eva will bring gorgeous edibles from her garden and Didi will teach you about how to prepare some simple & heavenly dishes. Come meet Malika and pick up some wonderful spices to pair with her beautiful new baking book. The book is brimming with gorgeous photos and original recipes. "Malika has a deep understanding and love for spice with a style that is uniquely her own. She writes with a Chicago heart, French respect, and a Pakistani soul, sharing sweet memories and recipes that change the way we experience flavors in dessert." How will climate change affect FOOD in the future? How can you be a part of positive change? Join us for a tasting of delicious global snacks and activities to deepen your knowledge of climate change and food security with the new United Nation's Cookbook "Adaptive Farms, Resilient Tables" (check out the Globe article here) now available at Curio for a suggested donation to the United Nations Development Programme. Andrea Egan from the UNDP will be here from 1-3pm to show a slide show of photos from her work with the UN Development Programme around the world. On April 6th, 7th and 8th neighbors Urban Hearth and Curio Spice Co. pair up to celebrate the new season with a menu highlighting Curio's directly sourced spices and Urban Hearth's seasonal, creative cuisine. Urban Hearth is a lovely café during the daytime (Tues-Sun) and for three nights each week they offer dinner service featuring seasonal, global cuisine in a warm, convivial environment. The spring spice dinner (prix fixe for either 3 or 5 courses, including a complimentary cocktail!) will delight your senses with dishes such as: burrata with lavender oil, orange and fennel, Peketoe crab with rose and coriander, locally fished Skate with morels, saffron and vanilla, and goat cheese Tortelli with peas, young garlic broth and Curio's signature Herbes de Romance. Chef-owner Erin Miller and Curio founder Claire will be there to join the conversation and share their shared passion for flavor. To reserve your spot at the Spring Spice Dinner, head over to Urban Hearth. Join us Tuesday evening, at Curio Spice, for a taste of Ether, Air, Fire, Water, and Earth -- the five great building blocks at the foundation of this 5,000 year-old medical art. Which of the elements make up your unique constitution, and how can you harness their power – through diet, lifestyle, and judicious use of culinary spices – to bring yourself into balance? You’ll leave with an understanding of the three constitution types – Vata, Pitta, and Kapha – as well as plenty of Ayurvedic diet and lifestyle tips, and a recipe for a delicious bedtime tonic called Ojas Milk. Tobin Hack is a Boston-based writer. She holds an MFA in fiction from NYU and a BA in English from Princeton University, and is working towards a 650-hour Ayurvedic Health Counselor certification from the Kripalu Center for Yoga and Health. An evening to learn all about Madagascar spices and how to cook with them. Our friend and former Peace Corps volunteer Matt Amato will join us to share his experiences working with vanilla farmers, and you'll take home recipes and your own vial of vanilla beans. 25% of your ticket purchase (as well as any Malagasy souvenirs you choose to buy) will benefit Macolline, a non-profit working to protect the Madagascar forest and generate jobs in the region we source vanilla. *UPDATE: Macolline is now working to help with recovery efforts related to the terrible destruction of cyclone Enawo and your help is greatly appreciated.